The 36-year-old Singaporean pleaded guilty to “making a threatening, abusive or insulting communication under the Protection from Harassment Act” at Singapore court last Friday. He was originally charged with “encouraging violence against the LGBT community,” an offense that could have landed him a maximum of five years in jail plus a fine. 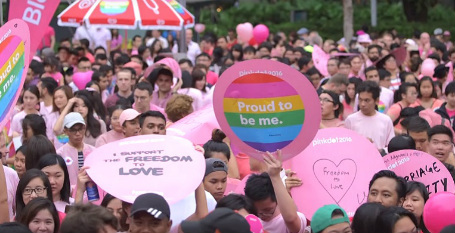 In a June 4 Facebook post on the page of a local group opposed to Pink Dot, an annual LBGT rally, Lim allegedly wrote: "I am a Singaporean citizen. I am a NSman, I am a father. And I swore to protect my nation. "Give me the permission to open fire. I would like to see these £@€$^*s die for their causes." The post quickly went viral and police were notified of the hate speech. He wrote: "I apologise for the misunderstanding. My words were strong. I did not mean anyone. I meant Bloomberg and foreign intervention in local matters. "This was taken out of context. I hope this clears the air. I did not mean physical bullets or physical death. I mean 'open fire' in debate and remove them from Singapore domestic matters." Lim's lawyer Adrian Wee said: "He has had his career, reputation and livelihood irretrievably tarnished by this event." In a June 4 Facebook post on the page of a local group opposed to Pink Dot, an annual LBGT rally, Lim allegedly wrote: "I am a Singaporean citizen. I am a NSman, I am a father. And I swore to protect my nation. "Give me the permission to open fire. I would like to see these £@€$^*s die for their causes. "The post quickly went viral and police were notified of the hate speech. He wrote: "I apologise for the misunderstanding. My words were strong. I did not mean anyone. I meant Bloomberg and foreign intervention in local matters. "This was taken out of context. I hope this clears the air. I did not mean physical bullets or physical death. I mean 'open fire' in debate and remove them from Singapore domestic matters. "Lim's lawyer Adrian Wee said: "He has had his career, reputation and livelihood irretrievably tarnished by this event." 'Open fire' in debate but he "wants these £@€$^*s die for their causes". Yeah, sure. "encouraging violence" would have been hard to prove without hard evidence. I'm sure his "career, reputation and livelihood" will recover. Worse threats and abuse have resulted in becoming leader of the world's super power after all. Ignorance is everywhere let us not forget this. Looks like he got out of the wrong side of bed in the morning of the day he made such a strong comment! There was no misunderstanding. Your words were clear and to the point. You threatened people with death - people you don't know and have done nothing to harm you. The fine was nothing more than a slap on the wrist. Your career was not irretrievably tarnished. I wonder what the penalty would have been if a gay man threatened to kill you. Believe me when I say that I have no wish to find out. Get help, Mr. Yang. You need it. Oh come on now! "Open fire" and "die for their causes" should be interpreted as a style of debate? That's one bad lawyer, yes, piss on our face and tell us it's raining! See, until these people disappear from this Earth, or more education, these people will continue to be the blight of humanity. "disappear from this Earth, or more education,"
Quite differing solutions. Maybe a bit more of the latter in your case also?